I argued last week that oil supply for the last five years appears to be in a regime were it responds only weakly to changes in the oil price, and that 2009 data very much fit the same pattern. I called this the era of inelastic oil. I then pointed out that assuming this continues, it's likely that developed countries, and the US in particular, will have to conserve extensively because oil usage in developing countries, particularly rapidly industrializing Asia, will very likely continue to increase. Since resources and workers in the US and Europe are currently underutilized, a recovery even to full utilization (eg normal vacancy rates and unemployment rate) will require additional oil. Since it's not likely that very much additional oil will be available at a reasonable price, the only way for the developed countries to recover is to get more oil efficient. 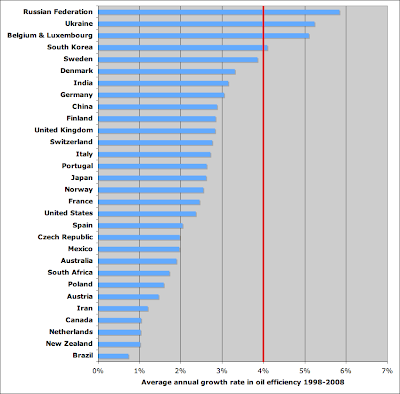 Therefore, in this piece I look at trends in oil efficiency, both across time and comparing the US to leading economic competitors. Firstly the headline graph, repeated below, shows the ratio of goods and services produced, per barrel or oil, for a variety of countries, over the last thirty years or so. Of course, it takes a lot more than oil to make the goods and services - other forms of energy are included, as are various forms of matter (iron, aluminum, etc). Finally, most of the cost of the goods and services currently goes on various forms of payment to humans - wages, profit, etc. However, oil is pretty essential to the production of most goods and services, and just about all of them in the United States which is completely dependent on oil for mobility. And so it's of interest to know who uses how much oil to produce a dollar of goods and services. 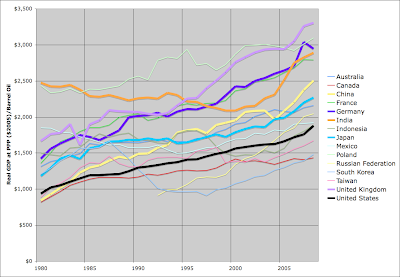 As you can see, the US (black line) compares unfavorably with most major economic competitor nations. The UK (financial services) produces nearly twice as much GDP with a barrel of oil as the US. Other big European countries - France (wine), Germany (cars) - are not far behind. China (consumer goods) and India (software) are both of tens of percent better than the US, and both are improving faster too. This is good news if you are British, German, Chinese or Indian. It's not such good news for Americans. The issue is this: in a bidding war for oil, who can bid more for a barrel - the folks who can turn it into $2500 or $3000 of goods and services, or the Americans who can only make it into $1800 of goods and services? Clearly, this oil-inefficiency puts the US at a disadvantage if oil is in an era of inelastic supply, such that prices are going to be high and volatile. If you want to feel really bad about it, look at it this way: the famously inefficient Russian economy now produces more goods and services with a barrel of oil than we do. 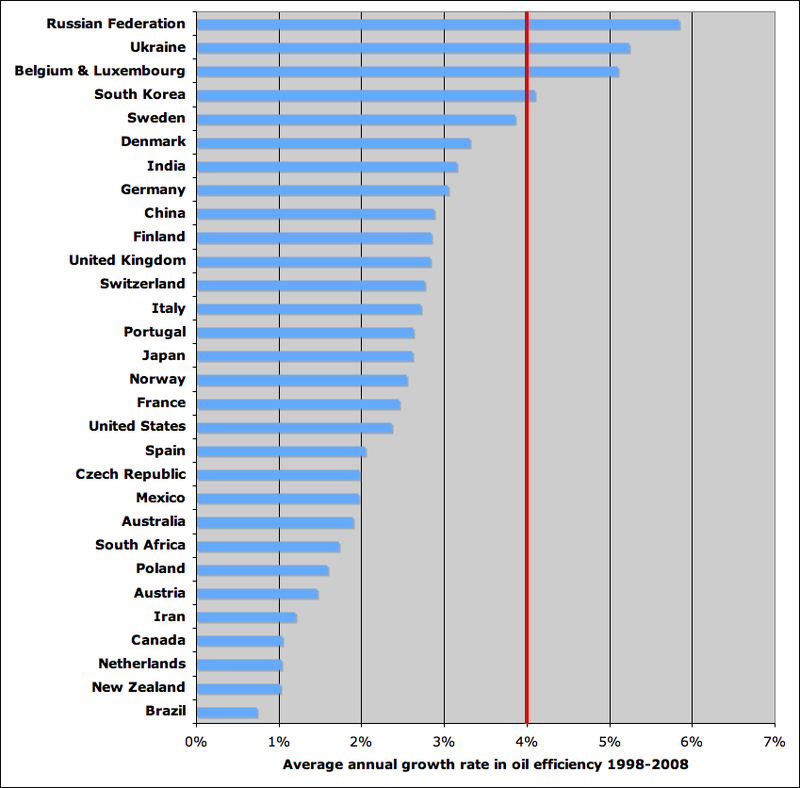 On the positive side, most economies have gotten markedly more oil efficient in recent decades. This next graph explores that for the last ten years. 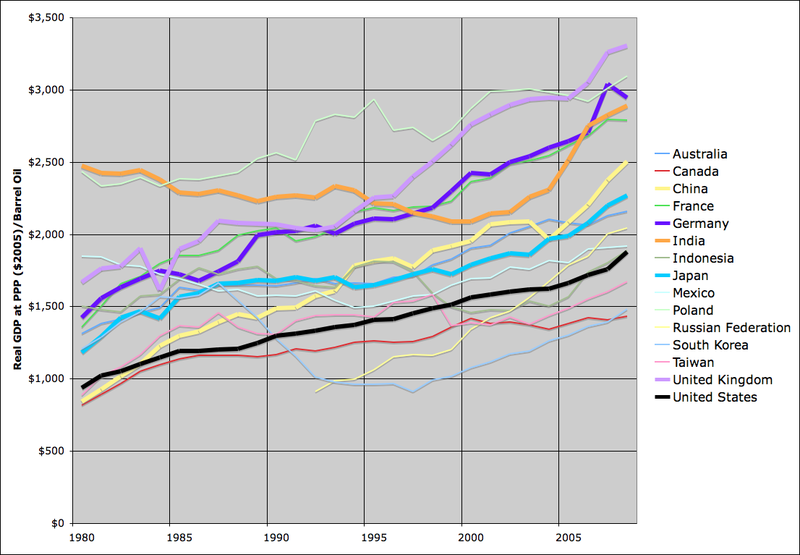 I've plotted the average annual improvement in GDP/barrel for a variety of countries of interest. The red line on the graph is at 4%. Last week, I showed that if global oil supply was flat, and if the developing regions of the world continue to grow at the rate of the last five years, then developed country oil consumption would have to decline at 4% per year. In that particular hypothetical future, oil efficiency would have to increase at 4% a year in order to avoid the OECD economies continuing to shrink. If you thought oil production would grow sluggishly, then the red line would be further to the left, and if you thought it was going to decline, then it would be further to the right. And of course, most people would like to see OECD economies grow, rather than stagnate. That would imply, in my best-guess scenario of roughly flat oil production over the next five years, needing to improve oil efficiency at better than 4% per year. As you can see, over the last ten years, a few countries, eg Sweden and South Korea, are demonstrating that this is possible. Other countries, the United States in particular, have to make progress significantly faster. 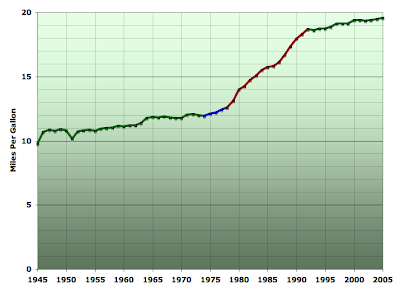 US economic output (GDP in chained 2005 dollars) per vehicle mile traveled 1960-2008. Source: FHWA for VMT data, BEA for GDP. Note a couple of things - historically, this ratio is pretty constant. In particular, note that it doesn't respond to oil shocks - in 1974, 1979, and 1991, you don't see the ratio jumping up much as people respond to sudden increases in the price of oil by cutting back on frivolous, uneconomic driving (a point I'll expand on in a future post). 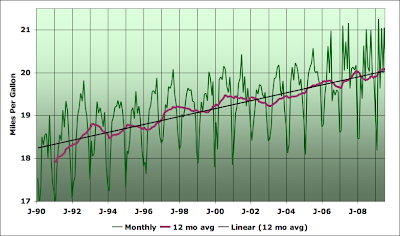 Secondly though, we do see this ratio improving from the mid 1990s on, with a short setback in 2001-2002. This pattern strongly suggests to me that the improvement is due to the deployment of the Internet. If you recall, serious commercial use of the Internet began around 1994-1995. The Netscape IPO - the first Internet related public stock offering - was in 1996. That's when that rise in this ratio started. And the setback to Internet business following the bursting of the tech bubble in 2001-2002 shows up in this graph, as does subsequent resumption of growth in the adoption and usage of the Internet. Proving this, and figuring out exactly how it would work in detail, which is a bit mysterious, will have to await future posts; for now it is just a strong working hypothesis. 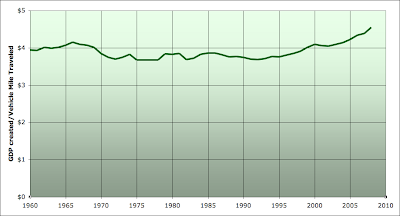 At any rate, the improvement in this ratio has been at an average rate of 1.5% a year over the decade 1998-2008. That of course has directly contributed to improving the oil efficiency of the US economy (and of course likely other countries too). But one thing we don't see, is much acceleration of this trend in 2005-2007 with the big oil price rise. That's unfortunate - it would be nice if we could raise our game in times of high oil prices, but so far we didn't in this respect. We also didn't in respect of fuel economy. This next graph shows the trend in US deployed fleet fuel economy for light vehicles. Note this is not the average fuel economy of new cars at purchase time. Instead, this is taking all of the vehicle miles driven by light vehicles and dividing them by the amount of gasoline sold (full methodological detail is at this old Oil Drum post of mine - see also here). 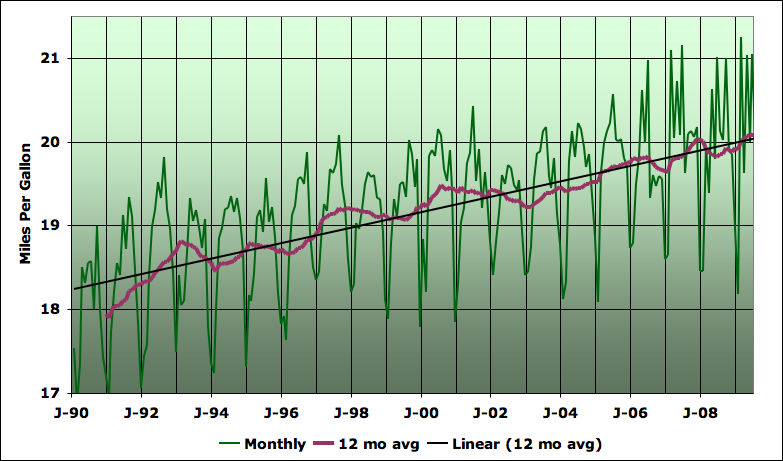 Estimate of US deployed gasoline fuel economy by month, Jan 1990-July 2009, with 12 month trailing average and linear trend. Graph is not zero-scaled. Click to enlarge. Source: FHWA for VMT stats, EIA for gasoline supplied, and Transportation Energy Data Book for diesel vehicle correction. Overall, this series has showed an average 0.52% annual improvement over the last ten years. Combining the mobility productivity and the fuel efficiency improvement, we get an overall improving of about 2.1%, pretty close to the ten year average improvement rate in GDP/barrel for the US, which was 2.3%. The interpretation of this fact is that productivity improvements in road transport oil efficiency roughly match those in the utilization of oil in non-road usages. Once again in fuel economy, we see that improvements are not happening as fast as it seems like we will need going forward, and in particular, the graph above does not show any improvement in the 2005-2009 timeframe - it kept pretty much to the long established trend. In short, the 2005-2008 oil price shock caused no discernible improvement in the long-term trend of gradually increasing oil efficiency. This is discouraging - people clearly did not get the message. Estimated fuel efficiency for all deployed gasoline vehicles in the United States by year, 1945-2005. Click to enlarge. Source: Author's approximate calculations based on FHWA Highway Statistics series for vehicle miles traveled data, and US EIA for data on finished motor gasoline supplied. See here for details. What you find is that in the period 1973-1978 (blue in this graph), after the first oil shock but before the second, there was also limited fuel efficiency improvement. It was only after the second shock in 1979-1980 that people got serious about making the auto fleet more efficient (red region is 1978-1992). Maybe, now, we are also waiting for that second shock in order to get serious again. The latest EIA STEO projects a 4% decline in oil consumption in 2009 and the IMF projects (as of Oct) that US GDP (PPP) will be 1.2% lower. (Deflated I guess that would be more like 2.3% or so lower). Working the numbers quickly I get approx 1.8% improved efficiency. Below par for the last 10 years. Minor editorial heads up: you linked to the PDF version of your Recent VMT and Fuel Economy Trends TOD article. When I attempt to copy the text of the title in the PDF I'm rewarded with "􀀁􀀂􀀃􀀂􀀄􀀅􀀆􀀇􀀈􀀉􀀆􀀊􀀄􀀋􀀆􀀌􀀍􀀂􀀎􀀆􀀏􀀃􀀐􀀄􀀐􀀑􀀒􀀆􀀉􀀓􀀂􀀄􀀋􀀔" Sounds like Collosus of the Forbin Project is telling me to eff off! I love this stuff. This morning was mulling over how to diagnose the impact of hybrid sales over the last decade, minor as they may be. People definitely are placing their bets on them, to our detriment; I think post peak it will be time for a major rethink of priorities - perhaps a period of rationing and carpooling while what's left of Detroit gets its act together? Or Smart etc. will change the game for all time with minimal vehicles that are little more than all weather golf carts, crash safety be damned. Wikipedia says 10% of US retail clothing purchases are on the web, and 6% of the total. Conversely to your theory, perhaps consumers backed off from discretionary travel while the economy continued to perk along due to excesses of credit, shoring up sectors of the economy that would ordinarily be impacted due to the public traveling less. Combien de valises avez-vous? Regarding France and wine, agriculture is 2% of French GDP; "beverages" constitute some smallish fraction of French exports. Something similar likely obtains with, oh, Nashville and country music. "However, oil is pretty essential to the production of most goods and services, and just about all of them in the United States which is completely dependent on oil for mobility." Really? We say that a lot in the peak oil blogosphere, mostly by folks who think declining oil extraction will inevitably bring down civilization, but I've never seen anyone make a good case for it. It seems as though much of the oil consumption in the world is for non-productive activity (I don't count long trips to work in SUVs as productive, when a short trip on a bike or bus would serve the same purpose if someone hadn't decided to live so far from work). How much oil is really needed, or even used, to produce a house, a computer, a wireless phone, an insurance policy, etc.? It's a different argument to say that we produce $X in goods and consume Y barrels of oil. We certainly consume the oil, but it doesn't seem like much of it is consumed in the production of other goods and services. It looks like many of the other countries are more efficient in this measure because they don't have so much single-occupant commuting in large personal vehicles. OTOH, how much oil we can buy given our poor gdp/consumption ratio is a terrific point. Unless the Asians continue to let us borrow to pay for oil, the US is going to be in a terrible position to bid for it. On the GDP/VMT ratio, I wonder how much of that can be explained by concentration of wealth. Certainly people tend to travel more as they become wealthier, but that's mostly an increase in flying, which doesn't show up in VMT, which only counts motor vehicles on the roads. (BTW, I found a new study on VMT and the economy while looking for an analysis: http://cascadepolicy.org/pdf/VMT%20102109.pdf. Supposedly the author isn't as political as the organization hosting the pdf.) However, the concentration of wealth in the US has become pretty extreme over the past 15 years or so. People like Bill Gates and Warren Buffet have so much of GDP locked up that they couldn't possibly travel by road enough to cover their share. That might partially explain that 2000 setback, since the wealthy were hit much harder than other Americans by the decline in stock values. Also, I'm sure you're right that the internet is playing a role, but I think that's only a part of the greater use of IT more generally. Kjmclark - I'll defend my position at greater length in a follow-up, but for now, of course I agree that we use oil inefficiently, but nonetheless, in the short term, it is essential to the production and delivery of goods and services. If you do the thought experiment of "No oil usage this week under any circumstances", it should be clear that only 1% of the US or so could get to work, ditto the mall, and very little work would get done, and very few goods and services would be delivered. KLR - thanks, I fixed that PDF link to point to the HTML version. Hmm. GDP - the chocolate teapot of comparative measures. Nevertheless, I suppose it's the best we've got. In 1965, the UK was powered almost entirely by coal and oil. By 1995, coal use had dropped by more than half, oil use was the same, and gas and nuclear made up the difference. Total energy consumption within the UK hasn't increased since 1995, although that is partly because we've offshored a lot of fossil fuel use to the Far East. We use it, but it doesn't show up on the domestic gauges. High oil prices and falling consumption, antionally or globally, must affect the UK economy. For a start, a big chunk of UK ecnomic activity, jobs and exports are tied to car manufacture and ancillary activities. Leisure, travel and tourism will decline, taking out hundreds of thousands of jobs. Having spent many decades building that late-industrial-civilisation idiocy known as a 'consumer economy', we can't simply say these are non-essential activities. Without them, we won't generate the wealth to build a 'real' economy. Nor can we borrow the money we need , because - guess what? - everyone else has the same problem. Everything comes back to the point made in the Hirsch report, which is that we could have preserved a renewable-powered simulacrum of today's society if we'd started work on it 20 or 30 years before peak oil. We didn't. And now we can't. More on GDP vs. VMT. This paper http://www.ce.utexas.edu/prof/kockelman/public_html/TRB04VMT.pdf, points out that VMT doesn't increase linearly with increasing income. Their data shows that it levels out and can even drop at higher incomes. Again, VMT doesn't count air travel. "For years, increasing income has been a principal factor contributing to the rapid growth of highway passenger travel. As incomes increased, the demand for additional transportation services manifested itself in a variety of ways: ... As a result, passenger highway travel, as reflected in vehicle miles of travel (VMT), increased rapidly." "But there have been discussions since at least the early 1990s about whether the effects of rising incomes on travel demand would start to diminish.1 That speculation now appears to be a reality as recent data suggest the relationship has weakened—vehicle travel growth has started to slow in comparison to growth in real personal income." The studies that essay looked at attribute the change primarily to saturation in the number of vehicles per household. There's a stronger relationship between increased vehicles and VMT than increased income and VMT. I can't find much that says it's due to the internet. Am I looking in the wrong places? WRT oil consumption vs. production of goods and services, I completely agree that we use lots of oil getting to places where we do productive work. If no oil use is allowed this week, that would indeed shut down everything, since agriculture runs on diesel. However, if we have to cut back 5% next year, it's not really clear to me that that would have to affect much more than personal transportation. If we wanted to, we could pretty easily ration the consumption so that agriculture, industry, etc. - things that use oil to produce something, aren't directly affected. A lot of people would be forced into some kind of car-pooling arrangement, but it wouldn't have to bring the economy crashing down. The rapid change probably would put us into a crash, but most of Europe manages to do pretty well without as much oil burning. Mike - agreed that ongoing improvements in vehicle technology were/are an enabler of better fuel efficiency. But consumers, and the product managers who study them, have a choice as to whether to take that improved efficiency in better fuel economy or more powerful vehicles. In the eighties, fuel economy motivated consumers, and it improved. After about 1992, with oil prices back down again, it stopped improving and cars just got more powerful. kjmclark - I'll read your links later and get back to you. Stuart, I think you're choosing the wrong thought experiment. Instead ask: how the US could cope with a 25% reduction in supply? The answer: reduction of personal transportation consumption (in the form, perhaps, of aggressive carpooling,) could supply all of that reduction. That would allow everyone to get to work and do errands (albeit at the cost of a lot of inconvenience and aggravation, not counted in GDP). So, the fact that the US has very large and inefficient personal transportation fuel consumption is very important to the comparison. Nick - we did get to see the results of the 70s oil shocks, which involved a series of reductions in supply of 7.8% in 1973, 8.9% in 1978, and 7.2% in 1980 (see here). In each case, there was a serious recession and yet the GDP/mile ratio barely budged. So, faced with the actual situation, people did not behave in the way that you think they ought to behave. I do not dispute that it's theoretically possible to keep the economy working with far less VMT - we know from the example of WWII that this definitely can happen. But people won't do it of their own free will - at least there is no historical evidence for that idea. So absent a major change in how we organize our economy, what you describe is very unlikely. Kjm - I looked quickly at your links, and also skimmed the Ponzin paper cited in your second link, which is well worth reading. I guess I'm not persuaded by the idea that VMT growth is declining because people are into the part the curve where it levels off with income - based on the graphs in the first paper, and a median household income in the US of about $35k, it doesn't seem to me that this effect should be too strong. However, a second hypothesis that definitely has some appeal is the idea that congestion is increasingly growing and imposing enough travel time burden on people that it's inhibiting trips. There's definitely evidence for increased congestion, and clearly that could explain the trend. I'm not attached to my Internet hypothesis at present - the timing looks about right, but I see it as an idea for future exploration, not something I'm certain of. In particular, a reason I hadn't considered it in the past was that telecommuting mode share is quite low (a few percent) and online retail is only 4% of overall retail. So those things alone could not explain as large an effect in the GDP/mile as we see. So, for it to be Internet related, I think it would have to be more of a time displacement thing - I'm less likely to to go drive somewhere because I'm glued to the computer at home. We will have to explore further in the future. Whatever the cause, it's an important trend, and helpful as far as responding to oil tightness goes. (I should have said that median household income estimate was for 1995 - it was just shy of $40k in 2003 dollars according to wiki, so must have been somewhere in the a bit north of $35k region in 1995 adjusting for inflation, which I can't be bothered to do properly right now). But people won't [reduce vmt] of their own free will - at least there is no historical evidence for that idea. There is, as mentioned yesterday, the substantial decline in VMT in the period beginning from mid 1979 to the start of the recession in early 1980. Over 2.5% decline not per capita :-) in only 8 months! What would have been achieved in 4 years if the recessions had not intervened? But consider this: driving is just one form of mobility albeit dominant. Are there data on miles flown? We know that consumption of jet fuel peaked in 2005 a couple of years before the current recession. Doubtless miles flown fell also. The trouble, I suspect, is not that consumers don't respond to oil prices by cutting driving but that their response helps bring on the ensuing recession. Stuart, my biggest concern was that it sounded like you were giving the internet most of the credit, when there are other more mundane possibilities. I think those of us who use the internet a lot tend to exaggerate its importance. I wouldn't argue that income trends mean that more people have risen into the portion of the curve where VMT declines. My argument was that rising income inequality was putting more of the population in the lower income groups that drive less. Looking into that more, the effect should be there (gini has been rising since the 70s), but it wouldn't begin to cause the amount of change in your chart. That may become a bigger effect now and in the future due to this recession. Whatever the reason, I agree it's a helpful trend. For other reasons, I've spent the afternoon poking around in real median household income data from the Census Bureau. Comparing 2008 with a dozen years ago, it's actually pretty hard to make the case either that lower income households are a greater chunk of the total, or that they are a worse off. But they definitely missed out on their share of the GDP growth. The high group that grew proportionately and did eat a lot more pie aren't interested in more driving as has been mentioned. Ponzin's "demand saturation". Hands down it's a factor. But how large? It probably could be estimated. Kjm - I don't see how relative income could matter here. If my neighbor gets richer, how does that mean I drive less? And although income inequality has indeed increased since 1992, absolute income has increased in almost all percentiles since then - it's just increased more for the wealthy than the poor. I agree the Internet thing is only an unproven hypothesis (which I think I was careful to say from the outset). I should clarify by saying that hands down Ponzin's demand saturation is a factor in the uptrend in real GDP/VMT since the nineties. But, agreeing with Stuart, it doesn't account for any absolute decline in VMT. Datamunger - ok I can see there's a colorable story that if the income growth starts all going to the top percentiles, VMT growth slows down. But I'd have to really see the graphs - does this story actually align with the trend we are looking at? My memory was the late nineties was exactly when the inequality was not increasing (increased under Reagan and Bush I and II, but not as much under Clinton). I could be misremembering though. Dunno very much about equality measures but I think you might be right. What I can say is that under Clinton the proportion of households making over 100K in 2008$ was expanding mightily. (which I think is what really matters for this issue. eg. how many may be maxed out in their driving). Post 2001 your GDP/VMT graph jogs up again. And I can't make a link e with the household income data. Post 2001 is the era of massive growth in financial services. One issue with the CB household income data is that while it spends lots of space picking over the details of poor people it doesn't give much on the rich (or I'm missing it). I'll see if can find some data else where on financial services. Yes! Here's something else of interest....the growth of debt service payments. And when you consider that indebtedness is probably more common among those whose demand is not saturated, it makes the effect greater. This graph from the fed might overlay nicely on your GDP/VMT.